This area is probably one of the smallest lost areas I have ever seen! The Wilmington Tow (exact name is unknown) is located on Rte 38 in Wilmington near the Woburn border. It operated at least during the 1950's/1960's, and offered skiing on 2 slopes, and perhaps 1 or two trails. It is also located at a ballfield, though the name of the park is unknown. One rope tow took skiers up between the two slopes, which had a very tiny 35-40' drop! The tow towers and pulleys still stand. Night skiing might have also been available. 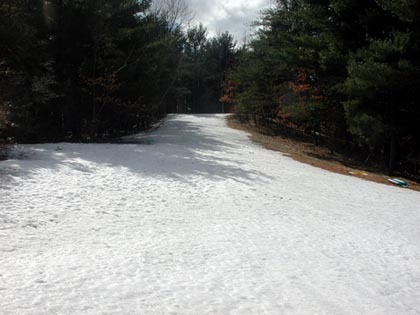 Here's a view of one of the slopes from the bottom (March 25, 2001). The old lift line. Notice how unbelievably short it is! Rope tow tower is visible at the top, as is another slope on the right. The reason for this email is that about 15 to 20 years ago, me and some friends of mine occasionally went sledding (and skiing-hiking involved) in Wilmington, MA off of rt. 38 near the Woburn line. If memory serves me, there was a frame of an old truck at the bottom (now gone) and two open trails. 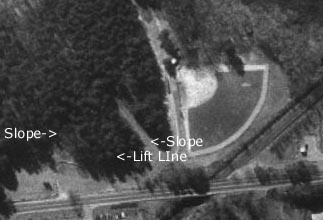 We also heard from Brad Charbonneau who had this to add about the ski area:It was a really small hill, but there are some old remnants from the ski operation at the top of the hill (telephone poles w/ metal spools on them), and some people told me of their grandparents skiing there many years ago. Al Fantasia also remembers this area: The Wilmington Ski area you mention was called "Town Park" by a lot of us who used it especially during the winter months, of the 50's and 60's. On top of the small hill, there was an old truck with dual rear wheels jacked up off of the ground. The truck was left in gear and the tow rope went through the space between one set of the wheels and provided the means to pull the skiers and kids with toboggans up the slope. The only protection from the pinch point of the rope and the wheels was a small snow fence. The hill was well used and soon after any snow fell it was quickly turned to hard packed ice, hard on the back when we fell. 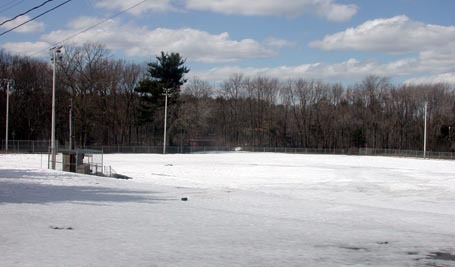 A view of the ballfield from the bottom of the ski area. Here's the Terraserver image of the former ski area. As you can see, there's not much to it. 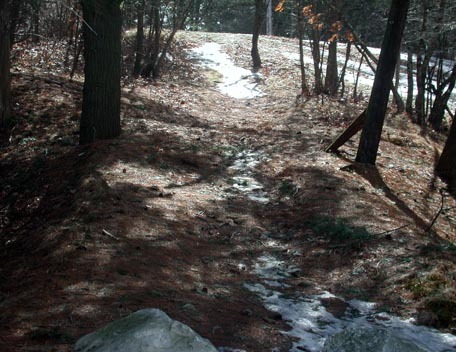 You can easily hike this ski area today, and enjoy the surrounding woods, as a Boy Scout Eagle Project has made a nature trail with interpretive signs. Do you remember this ski area and have more information? Email us and let us know about it!